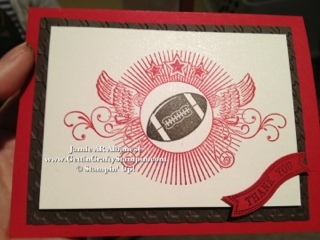 Getting Crafty with Jamie: Great Sport, my boy! My big, lil guy is the apple of my eye (well, he and his 5 sisters anyway). 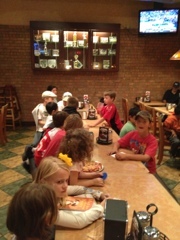 We celebrated the end of his most recent season of Flag football. 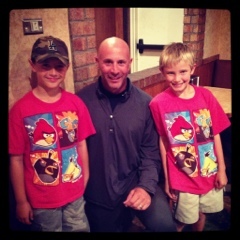 This year he was a 49er and their team rocked the 2nd place position in their league, losing in the last minute of the play-off game! 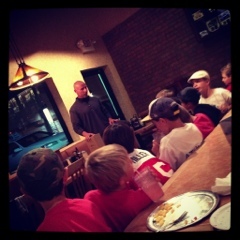 We enjoyed some amazing Toppers Pizza and thanked our Coaches, parents and team mates for a fun and action filled season! 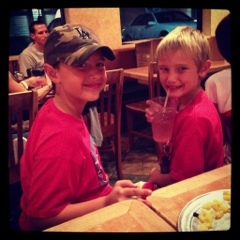 Sal's best bud Owen played on the same team as Owen's dad rocked as co-coach! The Geding family often kept Sal after school, doing home work, before Matt's taking him to practice for me (allowing naps for my girls!). They are such Heroes to us! A good friend is worth gold in this day and age! Thank you Greding family!! 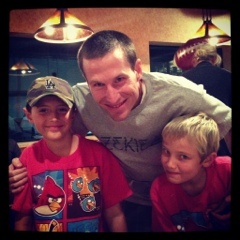 What a Great Sport our team was in wins and losses. 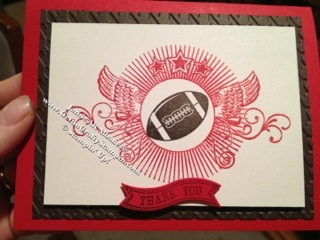 This is the card we created for the 3 coaches! With Real Red as the card base, we added Early Espresso that we ran thru the Big Shot with our Houndstooth embossing Folder. I like that the texture mimics the stitching on the football. This is subtle but a fun way to add depth and texture! 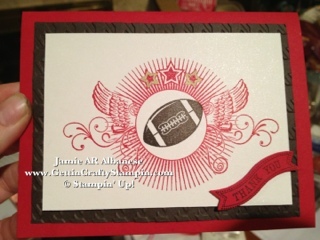 Using Shimmer White paper and Real Red and Early Espresso inks, the Great Sport and Itty Bitty Banners stamp sets we had fun making an impressive Football card for Super Star coaches! The subtle shimmer of the paper really adds a great element of fun and festivity while not being too sparkly, no "Manly Man" wants a sparkly card lol. I love that the Big Shot now offers Framelits. 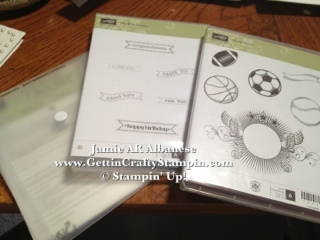 This makes it easy to stamp the sentiment or shape of the coordinating stamp sets! I simply used scraps of Real Red paper from another project and utilized the unused but still great odd space left. I love using scraps where I can! 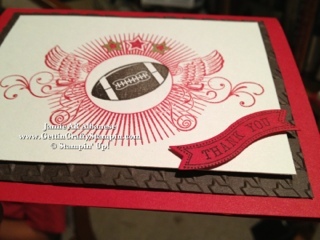 I like that the banners fits in with this stamp set and by stamping the Early Espresso ink on Real Red, I continue the look of our 49ers and still add contrast! What do YOU think?? Too simple? Just enough sparkle? Let me know what your thoughts are! Thanks for looking, sharing and leaving a comment! Have a Super Day and remember, be a Great Sport about it!